New York: M.D. 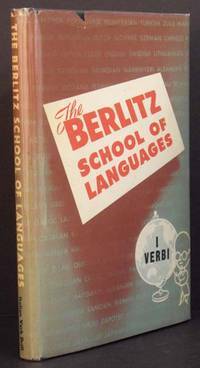 Berlitz, 1919. 1st. Cloth. Collectible; Very Good/Very Good. 1919 1st edition of this Berlitz Italian verb drill, IN THE UNCOMMON PICTORIAL DUSTJACKET. Solid and VG+ in a bright, VG example of the wonderful dustjacket, with light fading at the panels and very light chipping at the spine crown and panel top-edges. 12mo, 125 pgs.